- Do you remember one of my first baiting stories? With Rebecca and "Mongolian Bargain"? ( https://forum.419eater.com/forum/viewtopic.php?t=279922 ) ... well, after one year of her silence, Rebecca is coming to me again, from the deep blue. - Also for this time , "our" Rebecca is an american soldier (located in Kaboul / Afghanistan)... Obviously, she found some money and wants to send them straight out to me with a diplomatic courier. RE: URGENT BUSINESS ASSISTANCE FOR OUR MUTUAL BENEFITS. How are you and your entire family,, I know this letter will definitely come to you as a surprise, but I implore you to take the time to go through it carefully as the decision you make will go off a long way to determine my future and continued existence. Please allow me to introduce myself, I am Major. Rebecca Schiebles, in 4th Battalion, 64th Armored Regiment unit here that Patrols the Helmand province Afghanistan. I am desperately in need of assistance and I have summoned up courage to contact you. I am presently in Afghanistan and I found your contact particulars in an address journal. I am seeking your assistance to evacuate the sum of $3.800.000.00 (Three Million Eight hundred Thousand United States Dollars) to you as far as I can be assured that it will be safe in your care until I complete my service here. This is no stolen money and there are no dangers involved. Some money in US DOLLARS was discovered and concealed in barrels at a location in Helmand province when we conducted a foot patrol and it was agreed by all party present that the money be shared among us, this might appear as an illegal thing to do but I tell you what? No compensation can make up for the risks we have taken with our lives in this Hellhole. The above figure was given to me as my share and to conceal this kind of money became a problem for me, so with the help of a Canadian contact working with the UN here (his office enjoys some immunity) I was able to get the package out to a safe location entirely out of trouble spot. He does not know the real contents of the package as he believes that it belongs to an American who died in an air raid, who before giving up trusted me to hand over the package to his close relative. I have now found a secured way of getting the package out of Afghanistan for you to it pick up. I do not know how long I will remain here, as I have been lucky to survive two (2) suicide bomb attacks by Pure Divine intervention, This and other reasons put into consideration have prompted me to reach out for help, If it might be of interest to you then endeavor to contact me immediately and we would work out the necessary formalities but I pray that you are discreet about this mutually benefiting relationship. Thank you for your Co-operation, i will detail you more as soon as i hear from you, see photo of cash box during deposit. - Of course, the old bishop is very interested on this subject. God bless you, Mrs. Rebecca! I believe God made us meet, exactly when we need each other very much. Do you think that your money may could help me to rebuild our Church's roof? He's was burned from a thunderbolt, and our congregation did not have enough money to repair. I'm William Adamma, bishop of MhaireannachUainIvanthoirEaglais Church. - A long wall of words, from "our" Rebecca... and some fake pictures stolen from the internet. Thank you very much for your email accepting to assist me, Like I said in my previous email, i am seeking your assistance to evacuate the sum of $3.8m to you, as far as i can be assured that it will be safe in your care until we complete our service here. I will send you the details, but I have to be very sure that you are willing to assist me If we can agree on some terms then you will have yours and keep mine until we return, then the both of us can do this together. I agreed to offer you a reasonable percentage (40%) of the total sum of money as gratification for your assistance and cooperation, It's $100 bills throughout and it's contained in one trunk box, I'm thinking of tagging the box as "Personal Effects" and ship it out of Afghanistan through a special diplomatic scheme through the help of a Canadian Diplomat i told you about in my previous email. Please respond ASAP because I don't like the box to continue to be here, for security purpose. I advise you to please keep this issue highly confidential, Diplomatic shipment is a very secure and legal way of sending the trunk box of money out of here (Afghanistan), and I will discuss this with you in full details on my next email. Please do confirm to me if this is quite acceptable by you so that I can start making arrangements immediately to have the trunk box shipped out of Afghanistan. You may be wondering why i choose to trust a delicate matter like this in the care of a stranger, but this is the best we can do in my present situation, I would have trusted this kind of project in the hands of my Husband who was my closest confidant, but I lost him to cancer on 22ND April 2012, 7 months after we got married, and my only brother has ruined his life with HARD DRUGS, hence my decision to work with a neutral/God fearing person if we can establish some trust between ourselves instead of confiding in my buddies back home so that this little secret can be preserved. I will await your immediate response to this email, I am counting on your understanding and full cooperation in order to make this work faster. i can bet with my life that we cannot afford to fail with the arrangement already put in place for the delivery of the trunk Box of money to you. I await your immediate contact with me. Let me know what you have to say about the sharing ratio and also confirm your willingness to cooperate with me in this project by providing your direct cell numbers, home address and Identification (drivers license or international passport copy. I thank you for your trust and I want to assure you that my intentions are serious. I deeply regret your losses, but you have to be strong and overcome these moments of test that God has put before you. I'm an old religious man and all I want is happiness of my Parish. However, we are talking about a big/large amount of money and I want to be sure that everything is 100% legal and no unnecessary risks. Because you hast approached/written to me and giving me your confidence, I would like to know more details about you. If we decide to do this business together, we must know very well and we must have complete trust between us. As I already tell you, I'm bishop William Adamma, leader of MhaireannachUainIvanthoirEaglais (Scottish name of our Church). Born: 12 may 1924 (in Allanaquoich - Aberdeenshire). I don't have phone (I'm deaf) byI can read from the lips. I will have to ask my Secretary of our Church to get in touch with you, for all things related by our deal. He is young in his late 70-thies and he is the person in charge of our Church finances. The local manufacturer asked me £247,000 for the repair of the roof surface, but I want to do everything right. Fire burned also some of the wooden beams, so I want to redo everything from the beginning. Without going into details, I think my humble church needs £300,000. Maybe something more, because I want also rebuild even the small chapel, where are buried our ancestors Fathers. The rest of the money will be used for charity and social assistance. Your money will be safe until you are able to make order in your life. I know what a soldier's life means because I myself fought in World War II on the Normandy fields. RE: ARRIVAL OF DIPLOMAT HEINTZ WESELLY IN UK ON THURSDAY 5TH OCTOBER 2017. I cried this morning when I received your mail giving me full assurance that you will receive the fund and keep it save till my arrival, I do not need an attorney or a soothsayer to tell me that you are honest, reliable and trust worthy because I have been praying, asking God to link me with and honest and God fearing person to receive the fund. I want to notify you that i have completed all arrangements for diplomat Heintz Weselly to fly to Scotland UK with the consignment box, he will leave Kabul Afghanistan tomorrow being 4th of October 2017 to arrive in UK Thursday Morning 5th of October, Please stay around to pick up the box and provide a working PHONE/SMS line to connect you on arrival in UK very important for direction on arrival in UK. Note: what i declared to the delivery agent (HEINTZ WESELLY) as the contents of the box was PERSONAL EFFECT so on no circumstance should you let him know the content of the box to avoid diversion, If he ask you tell him the same thing. Thank you for your help in advance. Remember to keep this transaction CONFIDENTIAL, no second party should know about this cash delivery for security reasons, I have limited access to phone, always communicate me at all time by email, we do not need any lawyer mutual agreement on this transaction for security reason, the transaction is 100% legal and sure, Let me know if the delivery date is ok by you as I do not want the box to stay here for too long. Find attached Shipment Airway bill of the cash box. Send your identification (driver’s license or international passport copy). I’M SO HAPPY I’M DEALING WITH A BISHOP AND I BELIVE YOU WILL NOT BETRAY ME. - My bishop is very communicative and offers some details ... the phone number is very well known here (thanks Frost!) and "old brother" Lenny will be glad to communicate with the idiot. I will be more than happy to meet with your representative. Also, please let me pay her travel expenses, because I know what it means to be immobilized and you can not go before in the youth. If I will know exactly what Mr. Heintz Weselly's program is (his flight number and local landing time), I'll be able to send the van to the Aberdeen Airport to take it from there. The van is white and is inscribed on the side with the logo and name of our holy church, so it is easy to recognize. Jannisen is young at his 70s and is still able to drive the car through the city. Ahh, sometimes I'm jealous of his youth! The road from the airport to the church is pretty short, about 8 miles, but I want to be an excellent host and not let him take a taxi. I will ask my assistant Jannisen to look for my retirement certificate and scan it so I can send it to you as soon as possible. At my age, I am unmovable and I have not been traveling anywhere for over 20 years. All my roads are made with the church van, and Jannisen helps me with my invalid wheelchair. Our church phone is +4487XXXXXXXX and Father Lenny is in charge of taking calls to the parish. If you need me, it's more useful to communicate by email because Lenny has some moments in forgetting to write down all the details and I do not want to make any trouble. He is too old and suffers from Alzheimer's, but he is a faithful soul who has been with us for the last 40 years. In any case, we are prepared to meet Mr. Heintz Weselly and give him all due attention. I'm waiting for you with all the necessary details so we can successfully complete this operation. As a token of honor, I would like to ask for your permission to call the Great Hall (which will be rebuilt with your funds) by your name: Rebecca Schiebles Hall. Thank you and God will bless your soul! Thank you so much for your mail, accepting and paying his travel expenses, don't worry i have taking care of his travelling cost, the only help i will need from you now and urgently is £500 for his clearance at the Afghanistan airport since i'm far from the diplomat there is nothing i can do at this time. A soon as i hear from you the delivery agent will direct you where to send the fee for him using any fast transfer institution like money gram or western Union. I'm waiting for you to tell me when your Assistant Heintz arrives here. Should I give him all of this money? Or I have to place them in a sealed envelope to reach you? Last year, my holy church was cheated on a transaction made through WesternUnion, so I'd rather give up the money in cash. This is how we make sure that the payment reaches the right man. Note: on his Arrival in Scotland UK on the 5th being Thursday, he will contact you for Customs clearance at the Airport to avoid inspection ,please help me pay the fee 3,900GBP which will be reimbursed to you from the box in receipt of the box. Please, start sourcing for the fund and keep it intact so that it will not delay him at the airport to avoid the box passing through scanning, he will call you on arrival for the fee collection in person and payment of customs clearance. Please forward any of your ID for identification on arrival. Thanking you for your kind understanding and help in advance. REMEMBER IF HE ASK YOU THE CONTENT OF THE BOX TELL HIM IS PERSONAL EFFECT. 1) On Thursday, 05 october, your Assistant Mr. Heintz will arrive at Aberdeen Airport? Perfectly, I will send Jannisen to wait for him and bring him to the church. 2) Do I have to prepare the amount of 3,900 pounds in cash? ... or I need to add the suplementary ammount of 500 pounds (for Kabul Airport Clearance)? I do not want to make any mistake, so I prefer to ask twice. Please, tell Mr. Heintz to keep me up-to-date with his flight schedule and to send me all the necessary data in due time (flight number and exact landing time). Aberdeen is very crowded during this time of the year, and there are hundreds of daily flights there and I would not want Jannnisen to make a mistake. Theoretically, there should be no mistake, because we have received many guests here at the church, and Jannisen has always done great. Last my question to you: Jannisen must carry the money to the airport? Or do I keep all the money in my safebox and I give it directly to Mr. Heintz? Thank you for your mail asking for clarification, The lawyer assisted us in paying the 500GBP which you will reimburse him on arrival at the church address but the 3,900GBP you will keep at hand for clearance, on arrival in UK Airport he will call you or send you email directing you on how and where to collect the money for the clearance. Please feel free to email me if you have any further question, i'm online now. Please send your identification immediately..Note the the total sum in the box is 3,800,000GBP. My old head starts to spin. Please be patient with me and answer me clearly to every question... with YES or NO. In order for there to be no problems of interpretation (I honestly say that my English is somewhat bad, because we all are speaking here the old fashioned Gaelic dialect). Tonight, I'm going to look at my Retirement Certificate (surely it is somewhere in my home) and I will ask Jannisen to translate it into electronic form. I tell you very frankly, it discourages me all these wonders of modern technology. In my old time, people were writing letters on the paper and sending them with royal mail. And no one complained of a mess. The diplomat said on arrival he will call you for part payment of the total clearance/documentation fee 3,900GBP then after payment of part clearance/documentation your representative (JANNISEN)will give him balance. Tommorow Jannisen will go to the bank to withdraw the amount needed to pay from the airport. You say 3,900 pounds, yeah? Correct? The rest of the money (500 pounds) is money that the church has in the cashier desk, so it will not be a problem for me to pay that money when Mr. Heintz will gets to the church. Correct? Please tell Mr. Heintz to contact me as soon as he knows his flight schedule. My Jannisen is a good and faithful man, but he is not the sharpest knife in the kitchen (if you understand what I mean). We need to be sure everything is clear and transparent, so we do not have any unpleasant surprises. You also have to remember that Jannisen does not know Mr. Heintz, so we need to be very careful about this. I do not think it is desirable that Janissen walk with the money in his hand through the airport and ask everyone: "Mister, are you Mr. Heintz? Do I have to give you that money?" I am right, yeah? Because I'm immobilized in my wheelchair, I always have my tablet with me. Please write to me at any time of the day and night because I am permanently connected and I can see your messages almost immediately. Of course, sleep or eating hours are exempt. Thank you again for your good response, tell Bro, Jannisen to withdraw the 3,900GBP and Wai at the church, the diplomat will call you to send him 50% of the total fee for clearance, then after clearance and endorsement he will contact you again to enable Bro, Jannisen to come with balance before delivery to the church with Mr. Janissen. Please reply if you still need further explanation but bear I'm mind that I'm a soldier not a diplomatic delivery agent. What I'm telling you is in accordance with the instruction of agent Heintz Weselly. Forgive me, but I did not understand anything. I said my English is to blame, but please be clear. - I keep the money on me, at the church in my safebox? All the money? - How can I send 50% to Mr. Heintz? With Jannisen? To the airport, thursday? Please just keep the total money in your safe, agent Weselly will call you and instruct you on how to remit the fee to him for clearance and endorsement. Please ask your secretary to stay with the cell number at the church at 8_9AM to receive call. On his arrival he will call and your secretary will explain to you since you cannot answer call. I believe your secretary know the best way to communicate with you after receiving call. - Will we expect Mr. Heintz to call us on Thursday morning, first hours? - Then Jannisen goes after him to the airport? With half the money? 3,900 + 500 = 4,400 : 2 = 2,200 pounds? Yeah? But, is not it easier for Jannisen to wait for him Mr. Heintz directly at the airport and bring him to the church? Please stay at the church with the fee he will call you on arrival at the Airport. One he call you he will instruct you on what to do to avoid Jannisen staying at the airport for so long. Please comply with my directives. Rebecca, okay, everything is very clear now. May the God be with you! He has other diplomatic Language that belong's to USA Soldiers to deliver in USA before his final destination Scotland UK. Please kindly send me your Identification tomorrow morning very important or any of your photo. Have a wonderful night and may God bless you. - I sent 2 pictures taken from the internet .. I worked them so they would not be recognized by "google images search" engine... an old man, dressed as a Pastor. My dear Rebecca, what time is at you there, in Kaboul? Here is almost 10 o'clock at night and I'm gonna go to my bed. Does that mean Mr. Heintz does not come on Thursday? I need to know exactly when I have to send Jannisen to the bank, because it's not a good idea to keep this money in the church. I found 2 older pictures of mine and tomorrow morning I will ask Brother Erik to take one fresh photo. I will send it to you. Also tomorrow I'll try to look for that Retirement Certificate and Jannisen will go to the city to translate it on the copy paper. If you give me a valid address, I'll send it to you by royal post. I appreciate your urgent reply, is 1:57 AM here in Kabul Afghanistan. I'm in receipt of the photos you sent do not border sending Brother Erik to send the Retirement Certificate. Note: agent Weselly will leave Kabul Afghanistan today Being Wednesday 4th oct, 2017 to arrive in USA on the 5th and the same day Thursday he will arrive in UK, I advice you to make the fee available on the 4th of Oct, 2017 to be used for clearance and documentation on the 5th Oct, 2017 on his arrival in UK. - Well, with some luck, another idiot (an accomplice) will get tommorow somewhere to Aberdeen and he will try to phone Lenny... he probably will not understand anything. I think the church van will be broken and stuck there in the parking lot next to the monument. Perhaps Mr. Idiot Heintz will get there and maybe we have the chance to see him live. Does anyone have a UK telephone number and wants to participate in this story? In the role of Jannisen claiming "that damned engine" of the van and the fact that it can not move from there... obviously, the money is at Jannisen so Mr. Idiot has to go there. I'm in receipt of the New picture, thank you so much and may God bless you. Who is the woman beside you? Anyhow is 12: 26PM here in Kabul Afghanistan, the delivery officer agent HEINTZ WESELLY is on his way to the Airport with the cash box, he will call you on arrival in USA before proceeding to UK. Expect him in UK tomorrow between the hours of 7:30-8:00AM, please make sure you keep the fee ready i wouldn't want any delay, once he contact you comply with his directives. I have given him the church phone number and your email for easy communication, feel free to contact me by email at all time. THANK YOU AGAIN FOR YOUR LOVE, TRUST AND KIND HELP. Sister Vivianne is one of the parishioners of our congregation and is a real help to all our charity actions. In the afternoon I'll send Jannisen to the bank to withdraw the entire amount of money and tomorrow morning we expect Mr. Heintz to arrive at the airport. Please send me your assistant Mr. Heintz cellphone number and his e-mail address for better communication. God bless you! I think tomorrow will need help from a baiter who has a UK phone. To play the role of Jannisen, very angry that the van engine is broken and worried because he has a big amount of money to him. I have now checked the webcam and it works perfectly! - Mr. Idiot Heintz wrote to me... he wants to receive 850 pounds, with Western Union, at some US address. - In the same message, this idiot has attached a photograph of the latest tragedy in Las Vegas. I feel like I hate him already and I hope to let him wait through Aberdeen for many-many hours. GREETINGS IN JESUS NAME, MY NAME IS AGENT HEINTZ WESELLY THE DELIVERY AGENT FROM KABUL AFGHANISTAN SENT TO DELIVER CONSIGNMENT (BOX) TO YOU IN SCOTLAND UK. I'M NOW AT THE KABUL AIRPORT ABOUT TO BOARD BUT I GOT INFORMATION FROM MY COLLEAGUE THAT JUST ARRIVED FROM USA THAT SECURITY IS TIGHT IN USA DUE TO THE LAS VEGAS SHOOTING THAT TOO THE LIFE OF 50 INNOCENT CITIZENS. I WILL NEED YOU TO SEND 850GBP TO THE CUSTOM OFFICER (MICHAEL EXXXX MITXXXX) WHO IS OUR CONTACT PERSON TO OBTAIN NON INSPECTION TAG BEFORE MY ARRIVAL IN USA, I WANT EVERY THE ROAD CLEARED BEFORE MY ARRIVAL IN 13 HOURS. SEE ATTACHED PHOTO OF THE SHOOTING SCENE IN LAS VEGAS USA, PLEASE SEND ATTACHED COPY OF WESTERN UNION COPY AFTER PAYMENT TODAY. DELIVERY AGENT FROM KABUL AFGHANISTAN. As I have already told your boss, Mrs. Rebecca, we do not make advance payments through Western Union. Our church was cheated and we lost money in this way, so Rebecca and I agreed that the payment be made in cash. Secondly, our church is in the UK and we have absolutely no link with your trip to the USA. The American problems must be resolved locally there. The British problems will be solved here, in your presence and in the way it is already established. Please confirm your presence at Aberdeen airport tomorrow, Thursday, October 5, first hours of morning. Our money is at the bank and I have to send a church brother to withdraw the whole amount agreed with Rebecca. I do not want to keep such a large amount of money in the church for a long time because "money is the devil's eye and makes good people lose their minds." On arrival in UK he will get UK sim and call you.please follow his directives he is a professional, tested, honest and trusted delivery personal, to cap it all he is a believer/Christian. I receive a message from Mr. Heintz and I already answered to him. I think he did not well understand that our package is not related to his trip to America and I think he did not understand that we can pay in cash. I explained all these things and asked him to keep me informed of his flight schedule. - I think the courier (Mr. Idiot Heintz) wanted to keep for him the 850 pounds without his partner (Rebecca) knowing it. - They probably (I hope! ) quarreled with each other, because in the next few minutes I received some nice messages. NOTED, I WILL EMAIL MAJOR REBECCA SHCIEBLE RIGHT AWAY. - Old bishop awaits the courier and hopes that Heintz will spend many pleasant hours in Aberdeen. Mr. Heintz, please do it right now! We were expecting you tomorrow in beautiful Aberdeen. Autumn colors are gorgeous and the temperature is pleasant and suitable for your travel. It's a great city and I want to make you feel great here in our country. I hope to spend many pleasant hours together. I repeat the previous question: If there is any change in your program, please keep me informed! I told him not to bother you he should ask his customs officer friend in USA to help him and he will be well compensated on arrival. Expect him tomorrow by 8:00AM your time, stay close to your cell phone. Everything it will be ok, I'm in contact with your assistant Mr. Heintz. We will meet tommorow morning, if in America there will be no unpleasant incident related to aircraft flight. good luck though I look forward to reading what happens next. I had a lad talking about Las Vegas yesterday too. They are quick to capitalize aren't they? Just another reason why you should never burn a lad! - I hope to have some fun tomorrow morning. - It would have been great if we could talk to him on the phone. - Anyway, if he gets to Aberdeen and stays there for a few hours, he's still perfect! Thank you for everything, His friend in USA agreed to settle the fee in USA, Please give the delivery officer some money (1,000GBP) after receiving the box to pay him back. I will be online throughout tomorrow keep in-touch. - I thought it was not a bad idea if we were adding up the allocated funds, is not it? I'm already confused and do not understand anything. Initial account was 3,900 + 500 = 4,400 pounds. Right? You told me yesterday that I had to give half of them (that is, £ 2,200) to Mr. Heintz tommorow morning, and then the rest of the money (the other £ 2,200) would be paid after the receipt of the package. Now I see it comes a £ 1,000 supplement, which I do not know where to place. I have to send Jannisen to the bank to withdraw another 1,000 pounds, so would that be a total of 5,400 pounds? Please let me know, before the bank finishes working hours. This is one of the first lessons I have learned here. Hmm, this is the second ... the first was related to ITP, if I remember exactly. Chit-chat with Rebecca... it is assumed that diplomatic-assistant Heintz is on an airplane on his way to America. YES on his arrival he will call you for part fee 2,200GBP to clear the consignment then after clearance Jannisen will hand the balance to him to complete clearance fee before bringing him to the church.. The one 1,000GBP will be given to him later after receiving the box to refund the USA officer that helped him, For now Do not send Jannisen to the bank, the only money you keep in your safe is 4,400. Dear my daughter, everything is clear to me now. I will send Jannisen immediately to the bank to withdraw nearly 4,000 pounds (the rest of the money will come from what I can find gathered to the church in the box of mercy). Tomorrow morning, right after prayer, I will stop Jannisen from his daily routine and together we will wait for a sign from Mr. Heintz. I hope his flight will be pleasant and will be good for us. I will pray for him and you! At this time of the year, Aberdeen is a gorgeous, a very colorful city full of tourists. I'm sure Mr. Heintz will be delighted with the journey and, if his free time allows him, I will propose to him to stay overnight in the parish guest room. We have already arranged with the other members of our congregation to offer our guest a special treat: a pleasant evening with friends! We'll have food and soft drinks and Sister Vivianne will play some of her favorite songs. It will be great, I'm sure Mr. Heintz will appreciate our gesture. - Mr. Heintz will call at the church phone number... the "old" brother Lenny will answer. I'm sure there will be some major communication problems, but I've already said Lenny has Alzheimer's. - Probably the next "move" of Mr. Heintz will be a message to me. - I do not do phone-baiting, so I took care to "be present" to every message and to respond very promptly. So that I try to fill the absence of telephone conversations. - I'm going to tell Mr. Heintz that I'm sending Jannisen with the money, in the place Mr. Idiot will choose. Obviously, Jannisen has a technical problem with the van engine and is stuck somewhere in town. - I will ask Mr. Idiot to wait "a little, a very little"... because, is not it ?, we have the promise that the mechanic will repair the engine quickly. - Time passes and the technical problem proves to be very serious... Jannisen is stuck with money in the old town, just next to the Footdee War Memorial monument (https://www.google.ro/maps/@57.1422382,-2.0709479,21z?hl=en). - Mr. Heintz is awaited there... I'm going to ask him to take a taxi and meet Jannisen to get the money. - Obviously, the church van is not there because the mechanic dragged her to a car repair shop. But Jannisen will come back as soon as possible. - I'm glad to tell Mr. Heintz to come in to the nearby restaurant (I checked the area and it is a few meters from the meeting place... Silver Darling: http://www.thesilverdarling.co.uk/ ) and order everything he wants: food and drink. - In the evening, Sister Vivianne will contact him and tell him that the old bishop had a very easy heart attack and is hospitalized. - Sister Vivianne will ask Mr. Heintz to take a room to one local hotel by the next day. Certainly "tomorrow" all things will be clarified and the cost of the hotel will also be paided by the church. I did not come up with plans any further. New post - important update! Agent Heintz Weselly just informed me that he will arrive in UK with his partner Mr. Azziz Azziz, Please follow their instruction. Thank you Daddy for your help. There is no problem here, the church guest room has more beds and food is not a problem for us, the glory of the Lord! We will be happy to receive the two diplomats as appropriate, with all due respect for their rank and function. Can't wait to hear a meeting of Fater Lenny and Mr Idiot. I've already arranged this thing, with Frost ... we'll hear the conversation tomorrow morning. Wednesday, 20.45... a later "verification". Please send any of your old identification like drivers license, international passport copy, retirement document or church ID containing your name and date of birth. My heart is troubled, i want to make sure he hand the box directly to you after verifying with your ID. I trust you but i don't want him to hand the box to a wrong person. Please send Jannisen to scan and send any of the above document to me today so i can forward to agent HEINTZ WESELLY by email. Thank you for your Co-operation and God bless you. - My old bishop is very worried. After all, he has a large amount of cash in the church. It is not at all prudent to have so much money with you, with all the thieves that are in the world. Right? You forgot today to remember me the issue of the Retirement Certificate. We were lucky with Jannisen, who remembered we had to look for a document through my house. In short, I found the document and gave it to Janissen to copy it electronically. He's in the city now with various church-related activities, but he's going back here tonight. You will have that document in my next message to you. Do you have any news from Mr. Heintz? Did he land in America with good? Everything is OK and the situation has remained unchanged? I honestly tell you that I am not at all relaxed knowing that there is so much money in our church. It is imprudent to keep large amounts of money in cash because of the villains. I feel my old heart is going crazy, so I'm gonna ask Sister Vivianne to make me a valerian tea and I'll sleep earlier tonight. We hear tomorrow, just after the morning prayer. Janissen will stay next to me, at home, until we are contacted by Mr. Heintz. - Rebecca does not give up, she desperately wants to see an ID. - Probably Mr. Idiot Heintz and his partner Azziz have to come by some night train (I hope they will comes from London ). And they need to be sure that the job is serious. Please send the Document immediately i'm waiting so i can forward it to him for identification on arrival. Rebecca, you will receive the document as soon as Jannisen will gets home. I spoke now to Sister Vivianne and I gave him clear instructions to send a message to you with a copy of my Retirement Certificate. Now I'm going to my bed and I will pray that everything will be perfect tomorrow. Sweet dreams my dear! God be with you, my daughter! Thank you father/Bishop, sleep well and God be with you too. I will be expecting to receive document from Jannisen on his return. - Now the local time in Aberdeen is 19.19... in 3 hours, sister Vivianne will send to our lad a completely corrupted "inutilisable" file. She is a faithful woman, but computers are above her power. - Jannisen came drunk to the church and was ironic to Sister Vivianne. - Sister Vivianne is trying to send a message to Rebecca. - sister Vivianne it has not yet been able to attach the "file", but ID scann file it is there, somewhere... on the small and narrow object that needs to be inserted into the right hole. - If Rebecca is online and claims the absence of the "ID scan file", then Sister Vivianne will try to attach that file... Which (we already know ) is "corrupt" and does not open... But Vivianne does not understand all these things. Ahh, what a pity! Thank you but i did not get it, you have to attach before you send to me. Sleep well and may God protect you, ask Bishop Williams to send it to me in the morning 8:00AM your time. he knows how to attach and send it, he sent me attached photo today. Thank you for trying. God bless you. - "She" seems somewhat relaxed, so I think the two idiots (Mr. Heintz and Mr. Azzis) are already embarking on the night train that arrives in Aberdeen in the morning. - In addition, for tomorrow's action, William's retirement certificate (for his ID "verification") does NOT matter at all because the two idiots ANYWAY have to be in Aberdeen! See you tomorrow morning on the old quay in Aberdeen! - Bishop Williams woke up and checked the situation, noticing that Sister Vivianne failed to send a copy of ID paper (Retirement Certificate). - Eager to help, the old bishop sent that document... before starting any of his daily routine (Morning Prayers). - Now we expect Mr. Heintz to call "brother" Lenny and quarrel with him (Frost, please check the records, sometime after 8.00 am - Aberdeen local time). - The bishop's mail is ready to receive the messages. Looks like Sister Vivianne did not understand my explanations, so please forgive her. I immediately attach the copy of my Retirement Certificate. Soon I will start the morning prayer, and at about 0800 I will be ready for the visit that Mr. Heintz and his associate do in our beautiful city. I wish you a wonderful day, my dear daughter! - Rebecca wrote to our bishop... probably the train has not yet reached Aberdeen station. Please send the Retirement document ID by JPEG the PDF cannot open here. Expect agent Weselly and partner soon. What does it mean it does not open there? I checked the file on the stick and I see it perfectly on my iPad tablet. It's a simple pdf file type and I do not know how to make it jpeg. I can make a printscreen from the iPad with the file opened on the screen and send it to you if it's useful for you. At what time must Mr. Heintz and his associate Azziz arrive? Jannisen is right next to me and awaits instructions, but he has also a few ways to go to the old city. - Mr. Heintz and his partner Mr. Azziz they arrived in Aberdeen & they talked to "old brother" Lenny. - Of course, Brother Lenny is very kind and cute, but he can not make a conversation at all. - So, I expect a few angry emails. Mr. idiot Heintz: I will try to upload it. Mr. idiot Azziz: I will try to upload it. 09.05 - Aberdeen local time ... the two idiots arrived in Aberdeen. Good Morning, i believe Heintz Weselly and his partner have arrive in UK, Please be patient, may be they are making arrangement for the clearance. He will contact you soon for the clearance and delivery. Thank God that everything is fine! Old brother Lenny just told me now he had received some calls from someone who asked me, but he was not able to give me more details. Please tell Mr. Heintz to write me directly by email to avoid any embarrassment about the loss of details. Thank you my dear! - Hmm, things are not at all the way I expected... it seems they did not go to Aberdeen. - The two idiots claim to be in Heathrow Airport (London) and are stuck there... they claiming to send their money to Western Union. A lot of messages... Rebecca, Mr. Heintz and my character (old bishop). My dear daughter, Heathrow Airport is in London!!! Jesus Christ, I don't believe it! What are they looking for, there, in London? I can't call him Mr. Heintz but I already send a message to him. I'M HEINTZ WESELLY, I JUST ARRIVED IN HEATHROW AIRPORT WITH YOUR BOX, I HAVE COMPLETED ARRANGEMENT WITH THE CUSTOMS FOR THE CLEARANCE. YOU NEED TO FORWARD 2,000GBP USING THE CONTACT DETAILS OF THE OFFICER IN CHARGE TO ENABLE PROCEED TO ABERDEEN FOR THE DELIVERY. Mr. Heintz, yes, I know all this details. My personal assistant and driver Mr. Jannisen will be in charge with this problem. We have all the money in the church safebox. He can waiting you at the Aberdeen airport, if you can provide my your flight schedule and all the details (#flight number and estimated local arrival). He's got 2,200 pounds at the airport. ON MY ARRIVAL IN ABERDEEN YOU WILL GIVE IT TO ME BEFORE I HAND OVER BOX TO YOU. Mr. Heintz, I'm bishop William Adamma. I will attach you a very recent picture of mine. It's done yesterday, at Rebecca's request. NO I WANT YOU WRITE YOUR NAME, AGE AND CHURCH ADDRESS ON A PAPER, HOLD IT AND SNAP THEN FORWARD TO ME. I'M NOT COMFORTABLE WITH MY PHONE CALL SO DO THAT IMMEDIATELY IT WON'T COST YOU NOTHING. I TRIED CALLING YOU BUT CAN'T UNDERSTAND ANYTHING SO COMMUNICATE ME BY EMAIL AND YOU HAVE HASTEN UP WITH THE FEE. Mr. Heintz, yes I know. Our brother Lenny is old and suffering for Alzheimm, but is a very reliable and honest believer of our congregation. Rebecca she knows these details. Jannisen will be waiting for you at the airport, with those 2,200 pounds. He will hold a paper written with your name in his hands. At the arrival terminal, where travelers is awaiting. I need exact your flight details. I think you kidding me about that picture and I began to think that everything is just a sinister hoax. Such fables have already been made to us by the children of our neighbors. How can you tell me these things? I'm indignant and feel offended. I will communicate with Rebecca right now. YES, I KNOW BUT I WAS CHANNELED TO HEARTHROW AIRPORT, I HAVE WRITTEN TO REBECCA IF YOU ARE NOT READY TO COMPLY I WILL MOVE THE BOX INTO THE AIRPORT STORAGE VAULT. This incident is no longer my problem, and they are not the terms of the initial arrangement with Rebecca. I expect a response from Rebecca, but I can not send money to London now, in good time. He wrote to me please comply with his directives so that he can move on to your city immediately, i can't do anything from here. Send him what he need to meet with you, any church money spent will be reimbursed to you from the box. Your assistant is completely idiot and I think he's trying to fool you too. I can not send cash to London at this time. I do not have this possibility. Mr. Heintz was supposed to be here in Aberdeen. As I set it up!!! If you can believe that, he proposed me to make some shots with hand-held panels like a circus. Does he somehow think I am a child ??? All these last-minute bumps make me very nervous and make me nervous. You know that we've lost some money like that after a scam with Western Union. I'm afraid Mr. Heintz is not who he claims to be. YOU AND MAJOR SHOULD DISCUSS ND LET ME KNOW MAY BE I WILL STORE IT UP IN THE AIRPORT CUSTOMS VAULT AND GO BACK. NOTE: EVEN IF YOU SEND THE FEE WITHOUT YOU SENDING WHAT I REQUESTED I WILL NOT DELIVER THE BOX. Okay, we expect to see what Rebecca says. Under no circumstances will I send money with Western Union! Rebecca knows what problems I have already had with some internet fraudsters. The initial agreement was to meet in Aberdeen, NOT in London! I have canceled all my other current activities, and I have prepared for you a special day here. I am disappointed now and feel cheated in my expectations. Your claim, with those photos and panels kept in my hand, makes me believe that all is just a joke made by some children. I do not do that! Point! I think the absence of "real" phone conversations has made them suspicious. Because I can't doing phone-baiting, I think that's all I could get from Rebecca. I'm sorry, the story promised a lot! The conversations of the two idiots with Lenny (3 phone calls) can be heard on the SCAMBAITING HELP, HINTS & TIPS section on Lenny's Topic (by Frost). Well, Jolly good effort on your part I reckon mate, and it was a joy and a pleasure to read. Ok, talk with the sender I have today to stay in London. Okay, I wish you a great day! I have already deposited my money back into the bank account of my congregation. It is not prudent for us to keep a large amount of cash in the Lord's house. But I can withdraw them at any time, if necessary. If you come here, then we can meet and talk. But you must know that I canceled the organized party for your visit! As I told yesterday to Rebecca, our church has offered to pay all your travel expenses (of course, you have to keep all the receipts: train, taxi, some food & softdrinks, etc). 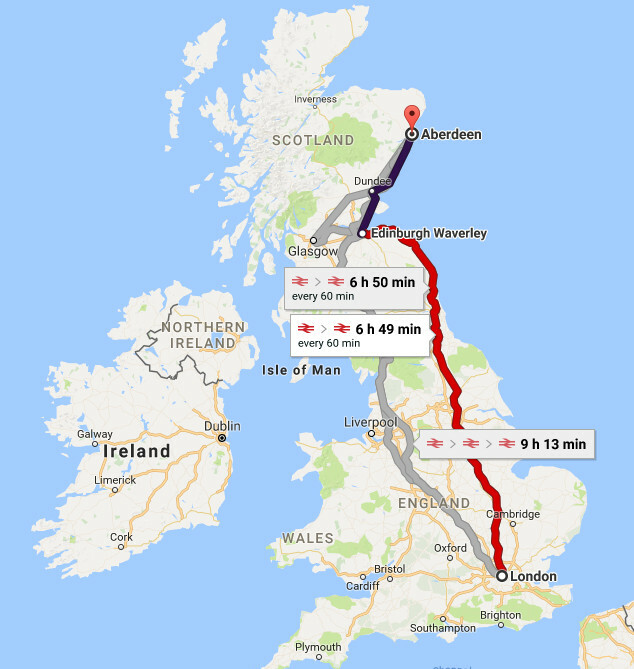 Theoretically, it's not that hard to get from London to Aberdeen. Take a train from London Kings Cross Rail Station to Aberdeen Railway Station. It is a direct journey with no changes required. You can meet Jannisen at Aberdeen station or you can take a short taxi trip to the Chapel. I'm immobilized in my wheelchair, but brother Jannisen will come to pick-up you at the Rail station. Jannisen is easily recognizable, an old man with red hair and red beard. Our van is white and is marked on its side with the name of our church. I wrote a message to TheMonsignor and asked him to help me with some phone conversation. We'll see if this story can go any further. How do I settle the clearance fee? Without paying the clearance fee and the.Tag obtained I cannot fly to Aberdeen. The choice is yours, send me ur church ID or international passport. Okay Mr. Heintz, let's clear things up! - By YOUR fault YOU landed on a WRONG airport and now I must to have this problem on "MY head"? Really? Are you serious? - Did YOU get on your way completely unprepared and did not know nothing about the people YOU need to meet? How is this possible, please explain me! - The Rebeca's parcel is just a personal effects package that YOU are paid to bring ME to MY address. Where I live, not in another city! - YOUR mistakes in logistics and YOUR incompetence in terms of package delivery are not MY problem and I do not have to fix anything! - I agreed with Rebecca to pay a sum of money for this service. 5,400 pounds! I agreed to send Jannisen with 50% of the amount, directly to the airport, to give you the money in advance. But the airport is ABERDEEN, not London!!! - YOUR aberrations with handwritten photos and show panels and rest of bullshits make me think you're a kid joking. This has happened to us once again, with the children of our neighbors. They called brother Lenny and ironed him on the phone, then recorded the whole conversation and made it public. - So, let ME be clear: Maybe I am an old and naive man, but I'm not sending anything more! I can agree to receive the parcel, directly from you, in the church house, with all parishioners present there. - If you come here, in Aberdeen, you'll get the money that I've set up with Rebecca plus your travel expenses. I was ready to accommodate you and give you a "special event" evening. Now I'm upset and canceled everything. - If you do NOT come here and insist on staying in London, well, I just tell you to take the package and take it back to Afghanistan at Rebecca. It's only your problem, how will you explain them the whole problem. Very well done! Obviously I like the more "religious" characters! @Lake Amour: Thank you! I love "religious" themes, so I've been doing more baiting stories about "church" and "prelates". Why have you chosen to jeopardize all my effort, anyhow I have instructed him to leave it at the airport storage vault since the customs will not allow him proceed without payment of storage fees. Please pardon him he said that he did not get direct flight to Aberdeen rather to London. Please find way and send him some money to clear the consignment, this is all I have worked all my life saving souls. Expecting good news from you. - Old bishop... I took the opportunity to offend him again. I'm extremely nervous, so it's better to wait 24 hours, so I can calm down and I can look at the situation rationally. - Today I was mocked in front of my church "family". I had to cancel the party! - I arranged everything for this visit, and your idiot wronged the airport! Unbelievable! - At the bank, yesterday, I had to pay a withdrawal fee... and another deposit fee today, because I do not want the Lord's House to keep nearly 5,000 pounds. One over the other, I feel betrayed! Your idiot did not know who I am, he wondered what he was calling for and he had the claim that I would send him some pictures made specifically for him with hand-written panels. Can you believe that? I felt that indignation was choking me and it was a bit short of me not to end any kind of communication right away. We'll talk tomorrow, after the night we'll all advise all right. Your stupid courier should have been on the train to Aberdeen at this time. I explained to him everything that should be done, with the timetable of the trains and the rails and I reassured him that all extra expenses would be reimbursed entirely by the church. I'm convinced he's drunk now, somewhere in central London's pubs. And tomorrow he will cry again that he does not have the money to train. Jesus Christ, I'm shocked! Birlic, your baits always make me laugh. Well done! There's still plenty of life in this one. - I received 2 messages from Mr. Heintz. - It seems he has not abandoned yet, so maybe we can still manage to get him to see the beautiful Scottish city. How was you night? Please let me know if we are still meeting in Aberdeen Airport today. Major, Rebecca asked me to wait that you will remit the part fee for clearance today. If the clearance fee is not paid today the customs will scan the box before moving It into their storage and I was warned by Major Rebecca not to allow the consignment pass through scanning. I have not settled anything with Rebecca for today and the money was deposited at the bank yesterday. I will write a message to her right now. Jannisen is out in town to solve other problems and probably he will returns in 2-3 hours. Just after that I can send him back to the bank again. You bought the plane ticket and can you send it to me? I need the flight details so I can send Jannisen to wait for you at the airport with the money. Also, for reimbursement of your expenses I will need to send me copies after all receipt. - The old bishop writes also to his "dear daughter"
I just got a new message from the courier right now. Do you think this idiot is able to get to Aberdeen today? I do not want to lose a whole day with him again. Coming to Aberdeen is no problem at all, i have been to old Aberdeen, Bucksburn, Bridge of Don Old Aberdeen. The problem we are having now is that we need to off set the clearance Tag fee, without reconcile the fee i cannot over with the consignment. Please message me to know what you decide so i can find account of the officer in charge so you can give Jannsen to remit 2,00 Pounds. Mr. Heintz, ohh, yes, the old part of the city still retains a special historical air and is preferred by all tourists. Regarding our subject, it's looks like it's still a problem for you to get here because otherwise we would not have had this futile discussion! It seems to me that you repeat again and again and this is not a good sign! Mr. Heintz, I will say for the last time. IF and only IF I'm convinced that it's not another joke, then I can send Jannisen back to the bank. And yes, he will wait for you at the airport with £ 2,200 at the time we will set it up together. He's a pretty old man and I do not want to stay in the airport for hours with all the money in his pocket. The contents of your mail is noted but my question DO YOU WANT ME TO COME TO ABERDEEN AIRPORT WITHOUT THE BOX THEN GO BACK AND PICK BOX AFTER COLLECTING FEE FROM YOUR PARTNER? My note: Yes, my dear idiot! I want you to come to Aberdeen and wait there for hours! The customs with not allow me to move without clearance payment so decide what you want. That's exactly what I want you to do! - If you did not go to the wrong airport and you came here yesterday, as was the initial agreement, then this stupid problem would have been avoided! - I'm not interested in your logistics and organization issues, because my only duty is to pay the money and wait for the package. - If it helps, I can come up with the problem and I can pay all the money in advance (although Rebecca and I only agreed to pay 50%). My note: Perhaps this offer will makes his journey more attractive to him. However, I really want to solve this thing so I'm willing to make you a concession. I hope to solve the problem and not to do the same thing as yesterday. Okay? 1) I PROCEED TO ABERDEEN AIRPORT COLLECT THE MONEY AND GO BACK TO LONDON FOR CLEARANCE PAYMENT AND DELIVERY. My note: YES, YES, YES!!! 2) YOU ASK YOU PARTNER TO SEND THE MONEY TO THE ACCOUNT OF THE CLEARANCE OFFICE IN LONDON SINCE YOU CANNOT DO WESTERN UNION. CHOSE ANY OF THE OPTIONS FOR ONWARD DELIVERY OF THE BOX OR I GO BACK TO AFGHANISTAN. I will choose option #1 - Jannisen will wait for you at the airport and will pay you the money. Nota bene: Jannisen is just a congregation brother, he is NOT my partner! Please send the money to him or ask him to come collect the fee and go for clearance before deliver. I'm ashamed of being annoyed so hard. But, I just feel my head explodes! Mr. Heintz was supposed to be here today, and the problem was solved. Instead, this morning I do nothing but talk to him and explain it the same thing! Again and again! Jesus, I'm already tired of this problem! Frankly, Mr. Heintz does not seem to be too smart. My note: I can not stop myself from indirectly offending it! My dear, you know something about Mr. Heinz? I wrote it for an hour ago and I have not yet received an answer from him... I am very stressed by this problem, I sent Jannsen to the bank to withdraw the money and I agreed with Mr. Heinz to pay the full amount . Now I'm stuck in my house and I'm waiting for a sign from him. Today I had a lot of work to solve in the city and I must lose again all day to coordinate this action. Honestly I tell you, I'm not happy at all! My note: I hope the two idiots are already on their way to Aberdeen. I checked on the live webcam ( http://www.seacroftmarine.com/webcam/west/ ) and it seems the weather is gorgeous today! Here's how it matters to talk on the phone with these idiots. Without phone conversations, the effort to trick them is much greater. Ok by me, before I proceed to Aberdeen I need his cell number so on arrival I will call him. Once I receive the cell number I will take off, what you give him is £3900. Mr. Heintz, let me know something. Did not you really talk to Rebecca before you leave Kabul? It's incredible how you react and postpone this process of delivering a simple package. Brother Jannisen is a 70-year-old man, not very smart but very diligent and honest. He is my personal driver and he helps me with all my household chores. Do you think I'm letting Jannisen solve the big things? Hmm, you kidding me! I need to know exactly the details of your arrival here. I tell Jannisen just what he needs to know: WHERE to go, with WHOM to meet, WHAT to do. This and nothing more! He will wait for you at the airport with a large cardboard written with your name (as usual). He is 70 years old, red hair and red beard. It's hot here today, so she'll probably be dressed in her eternal shirt with squares and a green khaki vest. When can I assume you will get here? It's already 11.00 AM and I've lost half a day with you and the problems you've created for your incompetence. My note: Take advantage of it and offend it again. I think he's crazy about nerves! Without a cell number I'm going nowhere. My note: They f*ck! This your conditions is not inline with our delivering policy. I will forward box storage information to you when you are read come down to London and pick your box. I'm trying to gain some time until I find a baiter with an available UK phone. Mr. Heintz, you really dissapointed me! Okay, I'm going to ask Jannisen to call you when he will comes back from the bank. He will talk to you only in my presence, here with me! No give me the cell number to call and time. Mr. Heintz, YOU tell ME what to do and when to do it? Jesus Christ! I have the impression that YOU forget who I am and who you are! Otherwise I do not explain this tone and this impertinence! Mr. Heinz, you have the obligation to deliver the package to me and I have the obligation to pay the price set with Rebecca. That's nothing more! For two days you make me waste time with dozens of messy messages and you want me to repeat the same things many times. I'm tired! You can not threaten me this way, because I am not your company's employee! Your mischievous mistakes do not concern me and my church! You have to talk to Rebecca and revise your attitude towards me! Tell her you refuse to deliver the parcel! At 16.00 I'll send Jannisen back to the bank to deposit the money. That was the last time you beat me and my trust! - Everything is quiet on the front of Aberdeen, so I've made a last try. - The bishop claimed Mr. Idiot to his "boss" Rebecca. Rebecca, you have to take action! I'm very upset and nervous! My blood pressure has increased and my heart is briskly in my chest. This time it can not be said that I have not had patience or goodwill with your insolent courier. Your courier shows a rare incompetence here in the UK. I honestly tell you, as he talks and behaves, Mr. Heintz is not good even to deliver pizza at home! The last time he told me he did not leave London unless he talked personally with good brother Jannisen. I explained that Jannisen did just what I was telling him to do, but Mr. Heintz insisted on the nonsense. He got to the point where he threatened me! Can you believe it? HE, a sinister imbecile, threatens ME, Bishop of the Church? My note: I could not restrain myself not to offend it him again. Dear my daughter, I've been around for almost 100 years and no one has ever talked to me like that before! My dear, I honestly tell you I'm tired of this story. I'm going to send Jannisen back with the money to the bank. It's the second time in the last two days when I have to do this and I already feel like someone is messing with me. Have you thought about using a skype number for this? They're not free, but they're cheap and you can get UK caller ID. Or perhaps a baiter already has one and can host the call? These numbers can usually receive voicemails as well. I still have UK numbers that work for outgoing calls (though no longer for incoming or for voicemail) and I'd gladly pay for some calls to your lad, however I am in GMT -5 timezone and also would need someone else on the call to do the voice (since I'm American... and female ). @Padme: Thank you for your help! - I cannot speak... I'm not native and I learned english from the internet and magazines. - If you want to participate at this story, I can give you the idiot phone number on PM right now. - You can be sister Vivianne. Without cell number no delivery. I Cried and nearly cry my eyes out when i heard you cannot send 2,00gbp to the agent to bring the box i have suffered to save for years. Father Heintz is an honest and trusted fellow, he has been delivering consignments to all the soldiers here and that was his reason for going through America, this is not the first time his is asked by customs to pay clearance charge and he told you before embarking on this journey. Had been have money i wound't have asked you to help him, now he have moved the consignment to a vault pending when you are ready to claim it. He will return tomorrow back tomorrow, Father please ask him for account to send the money to him so he can pay for the clearance TAG and proceed to Aberdeen, Father you are not doing this to him but for me and the church. Remember you promised to receive and safe guide the box. Father i trusted you do not leave me at the middle of the ocean, please stop him from leaving tomorrow and send the fee to him, any expenses made will be reimbursed from the box. - I talked with TheMonsignor yesterday to help me in the role of Jannisen. I think it was busy today, so I was not lucky. - Without the phone, the story can not go any further, so I have not answered yet the last 2 messages. Later edit: Padme, you have PM! - You can be sister Vivianne, she is already known by the two idiots. - To gain time, I'm going to claim that I suffered an easy heart attack (I'm 94 years old, it's natural to be more sensitive) and I'm hospitalized. - Sister Vivianne can coordinate everything. She can send the old brother Jannisen with the money (4,400 pounds) to the airport. - Sister Vivianne is not good at computers, but she wants to be nice and help. The good parent William suffered a mild heart attack and right now he is hospitalized. Padme, if you want to talk to Mr. idiot Heintz, then you're my guest. I'm sure he will appreciate some honest and warm words! Thank you and sorry for the heart attack of my daddy/Bishop Adma, forward your cell number and i will call you. - I think this idiot called "Rebecca" is already looking for a real woman who can play the role at the phone. - Of course, sister Vivianne is with "good Father" Wiliam in the hospital-salon... and does not respond to messages. Padme, TheMonsignor, are you here?